Combine chocolate chips and chocolate squares in microwave-safe bowl. Microwave on medium heat. Stir after 2 min. Repeat until smooth. Cool slightly. Combine sugar and shortening. Beat at medium speed until blended and crumbly. Beat in eggs one at a time then add salt and vanilla. Reduce speed to low. Add chocolate slowly. Mix until well blended. Stir in flour and baking soda with spoon until well blended. Shape dough into 1 1/4-inch balls. Roll in nuts. Place 2-inches a aprt on ungreased baking sheet. Bake for 8 min or until set. Do not overbake. 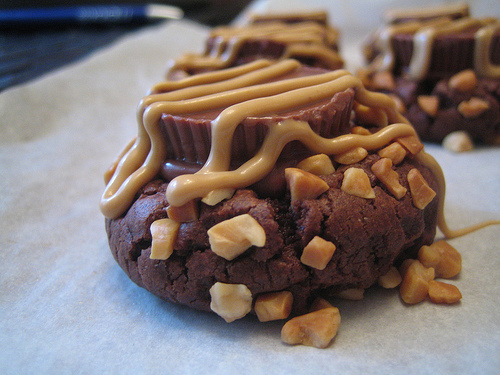 Press peanut butter cup into center of each cookie immediately. Cool for 2 min on baking sheet then remove to flat surface to cool completely. Place peanut butter chips in a bowl and microwave until smooth. Spoon into a sandwich bag. Seal and cut corner to pipe zigzags over cooled cookies.